Final urinary acidification is mediated by the action of vacuolar H+-ATPases expressed in acid-secretory type A intercalated cells (A-IC) in the collecting duct. Angiotensin II (AngII) has profound effects on renal acid-base transport in the proximal tubule, distal tubule, and collecting duct. 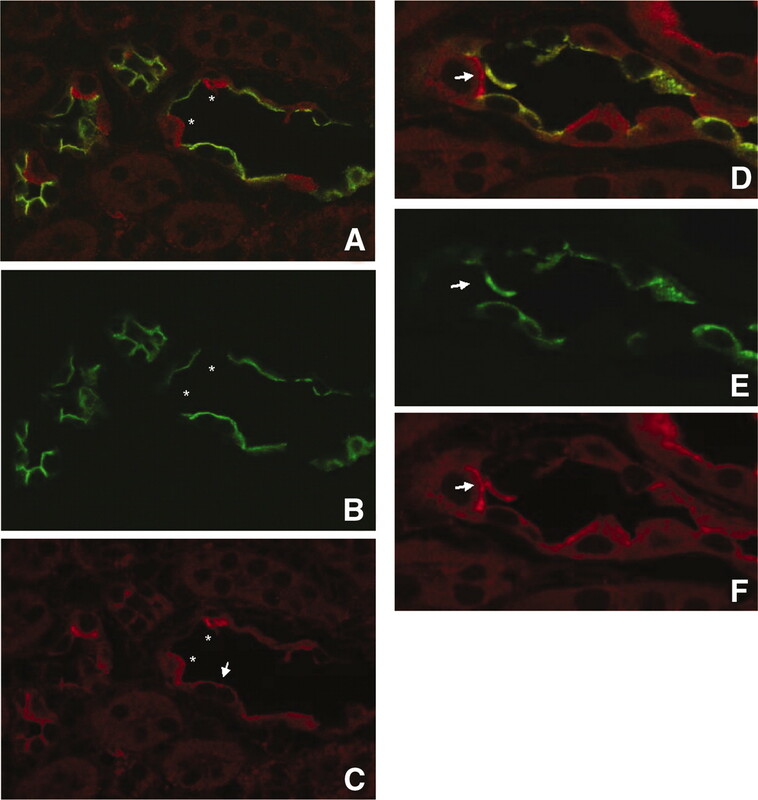 This study investigated the effects on vacuolar H+-ATPase activity in A-IC in freshly isolated mouse outer medullary collecting ducts. AngII (10 nM) stimulated concanamycin-sensitive vacuolar H+-ATPase activity in A-IC in freshly isolated mouse outer medullary collecting ducts via AT1 receptors, which were also detected immunohistochemically in A-IC. AngII increased intracellular Ca2+ levels transiently. Chelation of intracellular Ca2+ with BAPTA and depletion of endoplasmic reticulum Ca2+ stores prevented the stimulatory effect on H+-ATPase activity. The effect of AngII on H+-ATPase activity was abolished by inhibitors of small G proteins and phospholipase C, by blockers of Ca2+-dependent and -independent isoforms of protein kinase C and extracellular signal–regulated kinase 1/2. Disruption of the microtubular network and cleavage of cellubrevin attenuated the stimulation. Finally, AngII failed to stimulate residual vacuolar H+-ATPase activity in A-IC from mice that were deficient for the B1 subunit of the vacuolar H+-ATPase. Thus, AngII presents a potent stimulus for vacuolar H+-ATPase activity in outer medullary collecting duct IC and requires trafficking of stimulatory proteins or vacuolar H+-ATPases. The B1 subunit is indispensable for the stimulation by AngII, and its importance for stimulation of vacuolar H+-ATPase activity may contribute to the inappropriate urinary acidification that is seen in patients who have distal renal tubular acidosis and mutations in this subunit. Final urinary acidification and H+-ATPase activity in the collecting duct are controlled by several factors, including endothelin, angiotensin II (AngII), and aldosterone.1,2,4,5 The mechanism(s) through which AngII stimulates net acid secretion in the medullary collecting duct has not been fully explored. AngII, however, has been shown to stimulate acid excretion and bicarbonate reabsorption in the proximal tubule by acting on Na+/H+ exchangers, Na+/bicarbonate co-transporters, and H+-ATPases.6–9 In in vivo experiments, AngII stimulates also final urinary acidification.10–13 Thus, AngII may stimulate H+-ATPases in the collecting duct. Vacuolar H+-ATPases are composed of at least 13 subunits in mammals of which multiple isoforms exist.4,14 The B subunit belongs to the cytosolic V1 domain and is essential for vacuolar H+-ATPase function in yeast.4,14 In mammals, two isoforms of the B subunit, B1 (ATP6V1B1) and B2 (ATP6V1B2), have been identified. H+-ATPases that contain the B1 subunit were detected in the inner ear, in lung and epididymis, and in the kidney. In kidney, expression of the B1 subunit is restricted to IC in the late distal tubule, connecting segment, and cortical and medullary collecting ducts. In these cells, the B1 subunit is found in the plasma membrane and seems to be involved in acid extrusion.4,14 Mutations in the B1 subunit in human cause distal renal tubular acidosis with sensorineural deafness.15 This type of metabolic acidosis is thought to be caused by the partial or complete lack of proton secretion in the collecting duct. 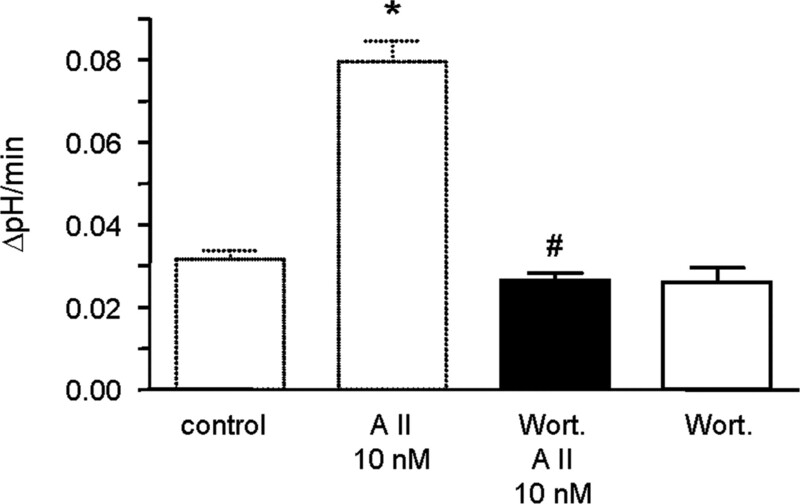 Accordingly, a mouse model that is deficient for the B1 subunit is not able to acidify urine appropriately and remove an acid load.16 H+-ATPase activity in IC from B1-deficient mice is attenuated.16 The B2 subunit, in contrast, is found in various tissues and can be detected both in the plasma membrane and in intracellular organelles and may serve a housekeeping function.4 In mouse and rat kidney, B2 is also found in IC with some labeling of the apical plasma membrane, suggesting that B2 may take part in acid excretion.17 The exact function of the B1 and B2 isoforms, however, has not been fully understood to date. Here we investigated the stimulatory effect of AngII H+-ATPase activity in A-IC of mouse OMCD. Moreover, we tested whether the B1 subunit is important for the hormonal stimulation that was observed with AngII. We present evidence for a specific function of the B1 subunit in the stimulation of H+-ATPase activity by AngII. Preincubation of mouse OMCD with 10 nM AngII for 10 min increased the Na+-independent alkalinization rate two- to three-fold to 0.080 ± 0.005 units pH/min. Addition of 1 nM AngII in the same experimental series did not significantly increase the alkalization rate (0.035 ± 0.002 units pH/min; Figure 1A). High supraphysiologic concentrations of 100 nM AngII resulted in a small stimulation (0.047 ± 0.005 units pH/min). The enhanced rate of pHi recovery in the absence of sodium was mediated by vacuolar H+-ATPase activity. OMCD were incubated for 10 min before experiments with the specific H+-ATPase inhibitor concanamycin (200 nM).20 In the presence of concanamycin, the rate of intracellular alkalinization was reduced 60 to 70% in control OMCD, and no stimulation was observed after incubation with AngII (Figure 1B). Inhibition of H+/K+-ATPases with SCH28080 (100 μM) reduced the rate of pHi recovery only by approximately 10 to 15%, similar in extent to the residual pHi recovery rate in the presence of concanamycin. Thus, AngII stimulates only vacuolar H+-ATPase activity in A-IC of isolated mouse OMCD. Angiotensin II (AngII) stimulates vacuolar H+-ATPase activity in freshly isolated mouse outer medullary collecting duct (OMCD) intercalated cells (IC). (A) Original tracings of intracellular pH measurements in single OMCD IC in the absence or presence of 10 nM AngII. (B) AngII (10 nM) stimulated Na+-independent pHi recovery of OMCD IC. OMCD were preincubated for 10 min with AngII, and AngII was present in all Na+-free solutions. AngII at 1 nM did not cause any significant stimulation, whereas AngII at 10 nM increased pHi recovery. (C) The major part of the Na+-independent pHi recovery is due to the activity of vacuolar H+-ATPases and can be blocked by the specific H+-ATPase inhibitor concanamycin (concan. ; 200 nM), whereas the H+/K+-ATPase inhibitor SCH28080 (100 μM) reduced pHi recovery only by 10 to 15%, similar in extent to the residual pHi recovery rate in the presence of concanamycin. The values of control and AngII-treated OMCD are shown again for comparison. *Significantly different from control; #significantly different from 10 nM AngII. AngII mainly signals through two main receptor subtypes, AT1 and AT2.21 Both subtypes of receptors were previously identified in the OMCD.22 Saralasin (1 μM) and losartan (1 μM), two AT1 receptor antagonists, prevented completely the stimulatory effect of AngII (Figure 2), whereas PD123.319, an inhibitor of AT2 receptors, partially reduced the stimulatory effect of AngII (Figure 2), indicating that the stimulation of H+-ATPase activity by AngII is mainly mediated via AT1 receptors. AT1 receptors are necessary for the stimulation of vacuolar H+-ATPase activity by AngII. OMCD were incubated with blockers for AngII type 1 or 2 receptors in the absence and presence of AngII (10 nM). Blocking of AT1 receptors with saralasin (1 μM) or losartan (1 μM) prevented the AngII effect. However, blocking of the type 2 receptor AT2 with PD123.319 (1 μM) partially reduced the stimulatory effect. The values of control and AngII-treated OMCD are shown again for comparison. *Significantly different from control; #significantly different from the 10 nM AngII activity. Localization of AT1 receptors in OMCD IC. Mouse kidneys were stained with antibodies against the AT1 receptor (red, C and F) and the principal cell–specific aquaporin-2 (AQP-2) water channel (green, B and E). Overlays are shown in A and D. AT1 staining was seen in cells that were positive and negative for AQP-2, demonstrating expression in principal cells and IC (IC marked with *). In IC, AT1 staining was mostly associated with the apical pole (arrowhead). Magnifications: ×650 in A through C; ×800 in D through F.
AT1 receptors couple intracellularly mainly via pertussis toxin (PTX)-sensitive small G proteins to phospholipase C, releasing intracellular Ca2+ and activating the protein kinase C (PKC) pathway.21,24 PTX (200 ng/ml), an inhibitor of Gi and Go small G proteins, had no effect alone but completely blocked the stimulatory effect of AngII (Figure 4A). Inhibition of phospholipase C activity with U73122 (10 μM) also impeded the stimulation by AngII. U73122 alone reduced the rate of alkalinization slightly but significantly (Figure 4A). The stimulatory effect of AngII is mediated via small G proteins and phospholipase C (PLC) and requires intracellular Ca2+. (A) The stimulatory effect of angiotensin is mediated via pertussis toxin (PTX)-sensitive (200 ng/ml) small G protein (Gαo or Gαi). U73122 (10 μM), an inhibitor of PLC activity, prevented the stimulation of vacuolar H+-ATPase activity induced by AngII. (B) Superfusion of IC with 10 nM AngII induced a transient rise in intracellular calcium. ATP (100 μM) was used a positive control (original tracing, left). Summary of data from 10 independent experiments showing the increase in intracellular calcium concentrations (right). (C) Chelation of intracellular Ca2+ with BAPTA-AM (50 μM) prevented the vacuolar H+-ATPase stimulation. Depletion of endoplasmic reticulum Ca2+ stores with thapsigargin (1 μM) had a similar effect. The values of control and AngII-treated OMCD are shown again for comparison. *Significantly different from control; #significantly different from 10 nM AngII. 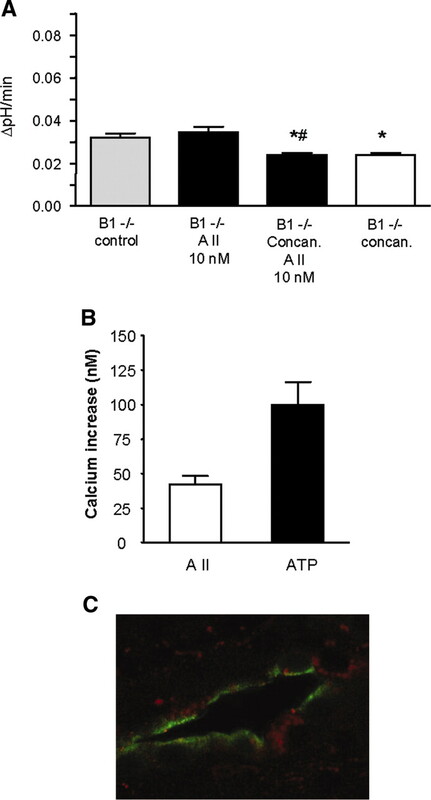 Intracellular calcium measurements demonstrated that AngII induced a rapid and transient increase in [Ca2+]i that was smaller than an ATP-induced (100 μM) rise in the same cells (Figure 4B). Chelation of intracellular Ca2+ by preincubation with 1,2-bis(2-amino-5-fluoro-phenoxy)ethane-N,N,N′N′-tetraacetic acid tetrakis (acetoxymethyl)ester (BAPTA-AM) (50 μM) abolished the stimulation of H+-ATPases by AngII. For examination of whether release of Ca2+ from endoplasmic reticulum (ER) stores was involved in this process, ER Ca2+ stores were depleted with thapsigargin (1 nM), which resulted in a significant inhibition of the AngII effect (Figure 4C). Thus, intracellular Ca2+ plays an important role in the stimulation of H+-ATPases by AngII. The inhibition of PKC activity with chelerythrine (1 μM) prevented completely the effect of AngII. Several isoforms of PKC have recently been described in mouse OMCD IC by immunohistochemistry, including the classic Ca2+-dependent isoforms PKC-α and PKC-β1 and the novel Ca2+-independent PKC-δ and PKC-ε isoforms.25–27 On the basis of the observation that intracellular Ca2+ plays a critical role, we tested the involvement of Ca2+-dependent and -independent PKC isoforms. 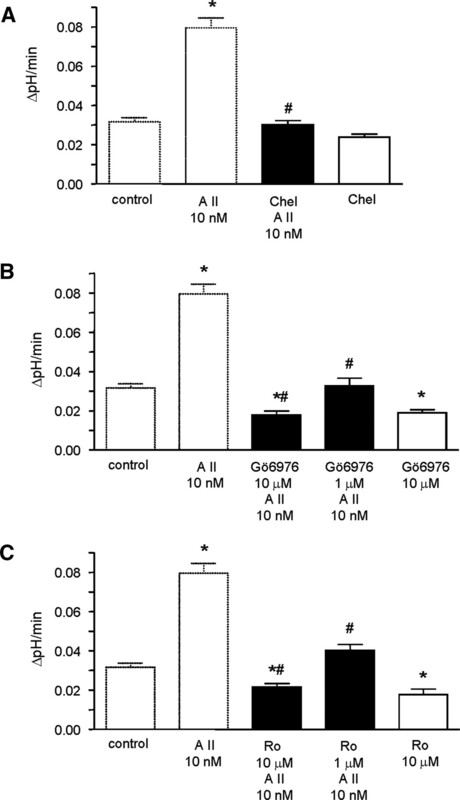 Incubation with Gö 6976 (1 μM), an inhibitor of Ca2+-dependent PKC subtypes PKC-α and PKC-β1, reduced the stimulation of H+-ATPases partially. Also Ro-31-2880 (1 μM), an inhibitor of Ca2+-independent PKC-δ and PKC-ε isoforms, attenuated the stimulatory effect partially (Figure 5). Using Gö 6976 and Ro-31-2880 each at a concentration of 10 μM, the stimulation that was caused by AngII was completely abolished. This may indicate that Gö 6976 and Ro-31-2880 used at higher concentrations may be less isoform specific. Moreover, the effect of AngII was completely inhibited when the activation of extracellular signal–regulated kinase 1/2 (ERK1/2) was prevented using PD098059 (20 μM) (Figure 6). 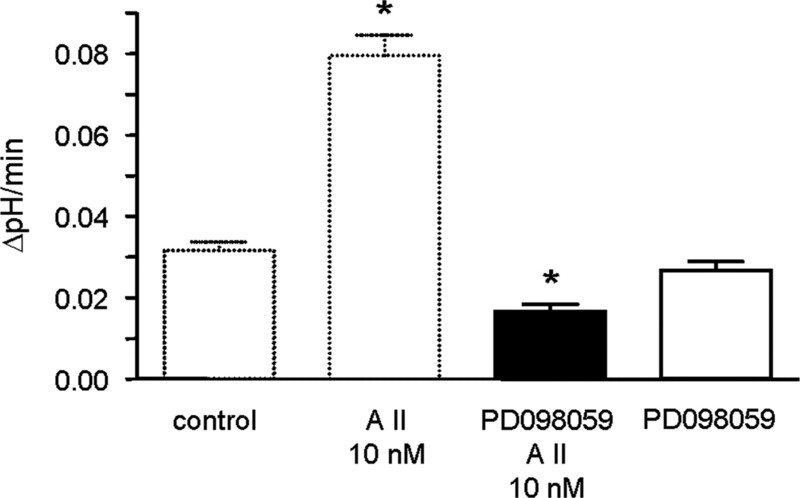 Preincubation with PD098059 alone had no effect on H+-ATPase activity. Different protein kinase C (PKC) isoforms are involved in the pathway activated by AngII. (A) Inhibition of PKC with chelerythrine (1 μM) completely prevented vacuolar H+-ATPase stimulation. (B and C) Inhibition of classic Ca2+-dependent and novel independent PKC isoforms PKC-α and PKC-β1 with Gö 6976 (1 μM) and PKC-δ and PKC-ε with Ro-31-2880 (1 μM), respectively, partially reduced stimulation. Higher concentrations of Gö 6976 and Ro-31-2880 (10 μM) completely blocked stimulation. *Significantly different from control; #significantly different from 10 nM AngII. The stimulatory effect of AngII is mediated via extracellular signal–regulated kinase 1/2 (ERK1/2). 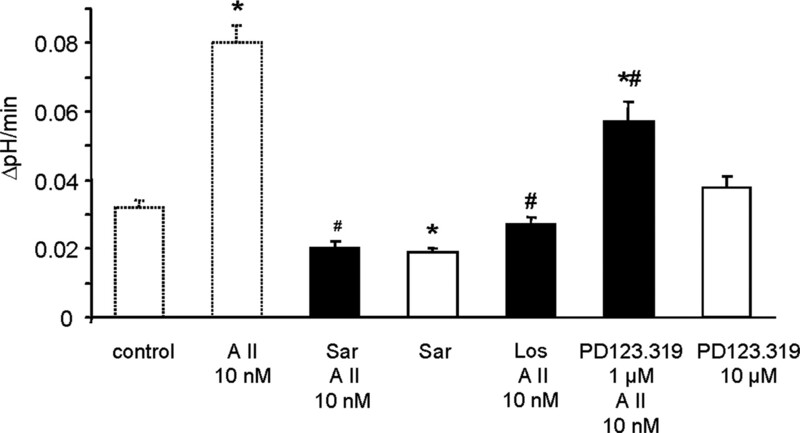 Incubation of OMCD with ERK1/2 inhibitor PD098059 (20 μM) attenuated AngII-induced stimulation. *Significantly different from control. Stimulation of H+-ATPase activity in various cells involves colchicine-sensitive trafficking and fusion of vesicles with the membrane depending on soluble not attachment receptor (SNARE) proteins and cellubrevin.7,19,28–33 Disruption of the microtubular network with colchicine (preincubation for 10 min, 10 μM) reduced the basal rate of alkalinization significantly possibly by inhibition of recycling of H+-ATPases. Colchicine completely abolished the effect of AngII (Figure 7). In addition, cleaving of cellubrevin, part of the membrane vesicle fusion complex, with tetanus toxin (50 nM) had no effect on basal activity but prevented the stimulation by AngII. Thus, the effect of AngII requires trafficking and SNARE-dependent fusion of vesicles that carry H+-ATPases or some of their subunits or possible accessory or regulatory proteins. The stimulatory effect of AngII depends on an intact microtubular network and SNARE protein complexes. 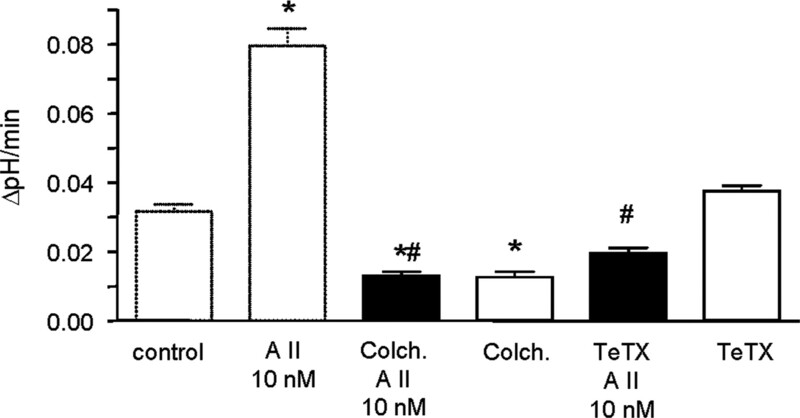 Disruption of the microtubular network by preincubation for 10 min with colchicine (Colch., 10 μM) or cleavage of cellubrevin, part of the SNARE protein complex, with tetanus toxin (50 nM) before exposure to AngII completely prevented the stimulatory effect. Colchicine alone reduced basal activity significantly. *Significantly different from control; #significantly different from 10 nM AngII. Phosphatidylinositol-3 kinases (PI3-K) have been implicated in the assembly, trafficking, and stimulation of vacuolar H+-ATPases by glucose,34 and AT1 receptor–mediated and PI3-K–dependent stimulation of Na+/H+ exchanger NHE3 activity was described.35 The PI3-K inhibitor wortmannin (1 μM) prevented the stimulation of the intracellular alkalinization rate induced by AngII, without affecting basal activity (Figure 8). The stimulation with AngII requires activation of phosphatidylinositol-3 (PI-3) kinases. The PI3 kinase inhibitor wortmannin (Wort. ; 1 μM) prevented the stimulation of vacuolar H+-ATPase activity. *Significantly different from control; #significantly different from 10 nM AngII. H+-ATPases contain either the B1 or the B2 isoform, forming part of the cytosolic V1 domain.4 The B1 subunit is specifically expressed in IC.36,37 It has been speculated that the B subunit may be involved in cell-specific subcellular localization, trafficking, or enzyme regulation.37 Hence, we used mice that were deficient for the B1 subunit (Atp6v1b1−/−) and tested whether (1) OMCD IC express H+-ATPase activity and (2) activity can be stimulated by AngII. The total rate of pHi alkalinization was similar in OMCD IC from B1-deficient mice (0.032 ± 0.002 units pH/min) as compared with wild-type mice (Figure 1). Inhibition of H+-ATPases with concanamycin (200 nM) decreased the rate of alkalinization significantly (0.027 ± 0.001 units pH/min), demonstrating that a vacuolar H+-ATPase is functional in the plasma membrane of IC despite the lack of the B1 subunit (Figure 9A). However, the concanamycin-sensitive rate of alkalinization was lower than that observed in wild-type mice (compare with Figure 1). AngII (10 nM) had no effect on the rate of alkalinization in the absence or presence of concanamycin. To rule out that AT1 receptors were absent or unresponsive in the IC of B1-deficient mice, we measured intracellular calcium in response to AngII and ATP as detailed previously. Both AngII and ATP elicited a rise in intracellular calcium similar to what had been observed in wild-type OMCD (Figure 9B). Furthermore, AT1 receptor localization was not altered as assessed by immunohistochemistry (Figure 9C). Hence, vacuolar H+-ATPases that lack the B1 subunit cannot be stimulated by AngII. The B1 subunit of the vacuolar H+-ATPase is necessary for its stimulation with AngII. 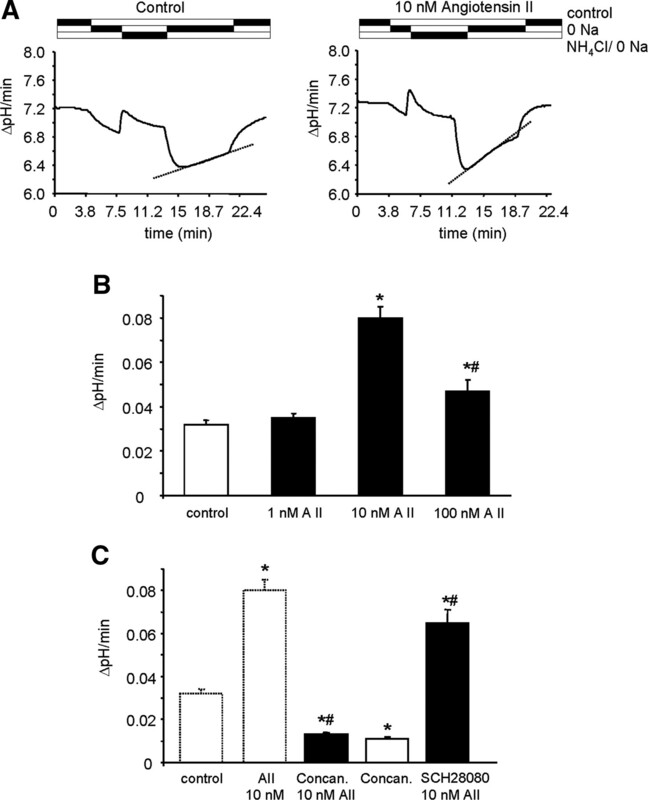 (A) Preincubation of OMCD from B1-deficient mice with AngII (10 nM) did not show any significant stimulatory effect on the rate of intracellular alkalinization. Concanamycin (200 nM), a specific inhibitor of vacuolar H+-ATPases, reduced the rate of intracellular alkalinization in the absence and presence of AngII to the same extent, demonstrating that AngII did not stimulate proton pumps that lacked the B1 subunit. (B) The presence of functional AngII receptors in OMCD IC from Atp6v1b1-deficient mice was confirmed by measurement of intracellular Ca2+ changes in response to AngII (10 nM) and ATP (100 μM) as a positive control. Intracellular Ca2+ increased in OMCD IC to a similar extent as shown in Figure 4 (n = 12 cells, four OMCD). (C) Staining for the AT1 receptor (red) and the AQP-2 water channel (green) in the OMCD of B1-deficient mice. *Significantly different from control; #significantly different from 10 nM AngII. Some reports indicated that AngII may inhibit urinary acidification, bicarbonate reabsorption, or H+-ATPase activity in the rabbit initial cortical collecting duct and the rat OMCD and inner medullary collecting duct, respectively.47–50 However, these studies are in contrast to a large number of observations demonstrating that AngII stimulates final urinary acidification in these nephron segments and that blockade of the angiotensin system reduces urinary acidification.5,10–12,39,44,51,52 We cannot exclude that the discrepancies may be either due to different species used or because we used superfusion of OMCD in contrast to perfused nephron segments, which may alter the access of AngII and other inhibitors to the luminal membrane. Regulation of H+-ATPase activity can occur through several distinct mechanisms,4 and trafficking of vacuolar H+-ATPases plays a major role. Physiologic stimuli lead to increased proton secretion such as CO2, acidification, or hormones such as AngII or aldosterone.4,7,19,33 Insertion of pumps or its subunits into the membrane requires an intact microtubular network7,19,33,54,55 and proteins that are involved in vesicle fusion, such as SNARE proteins.28,29,56 The inhibition of H+-ATPase stimulation by colchicine and tetanus toxin suggests strongly that AngII increases proton pump activity through trafficking of proton pumps or some of its subunits or accessory proteins into the membrane. Evidence from yeast suggests that specific isoforms of some subunits could play a role in targeting, trafficking, and adaptive changes in the ratio between ATP hydrolysis and proton pumping.4 Particularly the two isoforms of the B subunit and various isoforms of the a subunit have been implicated.4,37 No evidence for isoform-specific functions for mammalian subunits has so far been described even though the cell- and organ-specific expression of some subunits has been noted. Organ-specific inherited diseases such as malignant infant osteopetrosis (mutations in the a3 subunit), distal renal tubular acidosis (a4 subunit), and distal renal tubular acidosis with sensorineural deafness (B1 subunit) underlined the concept of isoform-specific functions of vacuolar H+-ATPases.4 Here we find that H+-ATPases in the OMCD that lack the B1 subunit maintain a basic level of activity but cannot be stimulated by AngII. This activity is most likely due to substitution of lacking B1 subunits by the B2 isoform, which show enhanced luminal appearance in the B1-deficient mice.16,17 Apparently, the B1 isoform performs functions that cannot be compensated by the B2 isoform, suggesting that B1 is involved in the cell-specific stimulation that could involve trafficking or assembly of pumps. This interpretation is also in line with some recent data demonstrating that overexpression of some B1 mutations that were found in patients impairs assembly and trafficking of proton pumps to the apical membrane.57 The absence of a functional B1 subunit in patients and mice leads to defective urinary acidification.15,16 AngII has been shown to be involved in the adaptive increase in urinary acidification during acidosis, and that vacuolar H+-ATPases in IC that lacking the B1 subunit are insensitive to stimulation may help to explain this phenotype. We identified AngII as a potent stimulus for H+-ATPases in OMCD A-IC. The stimulation is transmitted via a distinct signal cascade and requires the presence of the B1 subunit of the vacuolar H+-ATPase. The lack of stimulation by AngII may explain the inappropriate adaptive urinary acidification during acidosis of patients with mutations in the B1 subunit. C57BL-6J (Jackson Laboratory, Bar Harbor, ME) and B1-deficient mice (Atp6v1b1−/−; male 12 to 15 wk of age, 30 to 35 g) were housed under standard conditions. Breeding and genotyping of Atp6v1b1−/− mice has been described previously.16 All studies were approved by the Local Swiss Veterinary Authority (Veterinäramt, Zurich, Switzerland) and were according to Swiss Animal Welfare Laws. Coverslips were transferred to a thermostatically controlled perfusion chamber (approximately 3 ml/min flow rate) maintained at 37°C on an inverted microscope (Zeiss Axiovert 200, Feldbach, Switzerland) equipped with a video imaging system (Visitron, Munich, Germany). The isolated OMCD were incubated in a HEPES-buffered Ringer's solution that contained either the pH-sensitive dye BCECF-AM [2′,7′-bis(2carboxylethyl)-5(6)-carboxyfluorescein ester; 10 μM; Molecular Probes, Eugene, OR] or the calcium-sensing dye FURA-2-AM (5 μM; Molecular Probes) for 20 min and were washed to remove all non de-esterified dye. pHi was measured by alternately exciting the dye with a 10-mm-diameter spot of light at 495 and 440 nm for BCECF and 340 and 380 nm for FURA-2 while monitoring the emission at 532 or 510 nm, respectively, with a video imaging system. Each experiment was calibrated for pHi using the nigericin/high K+ method, and the obtained ratios were converted to pHi.18,19,58 FURA-2 measurements were calibrated for [Ca2+]i with high (2 mM) and zero calcium solutions in the presence of a calcium ionophore and [Ca2+]i calculated.59 All experiments were performed in the nominal absence of bicarbonate. The initial solution was a HEPES-buffered Ringer solution (125 mM NaCl, 3 mM KCl, 1 mM CaCl2, 1.2 mM MgSO4, 2 mM KH2PO4, and 32.2 mM HEPES [pH 7.4]). Cells were acidified by using the NH4Cl (20 mM) prepulse technique and washed into a Na+-free solution (Na+ was replaced by equimolar concentrations of N-methyl-d-glucamine). The rate of H+-ATPase activity was determined as the concanamycin-sensitive pHi alkalinization rate in the absence of Na+. Rates were calculated over the same range of pHi (6.55 to 6.75) for all cells studied. OMCD were used only for one single experiment (one NH4Cl prepulse as repetitive intracellular acidification altered recovery rates in our hands). For the inhibitor studies, OMCD were preincubated with the inhibitors alone for 10 min, then co-incubated with BCECF for another 10 min. The inhibitors were also added to all solutions in the absence or presence of AngII, respectively. All chemicals were from Sigma (Buchs, Switzerland) and Calbiochem (Dietikon, Switzerland). Immunostaining on paraformaldehyde/lysine/periodate-perfused kidneys was carried out as described previously60 using rabbit anti-AT1 receptor (Santa Cruz Biotechnology, Santa Cruz, CA),22 1:200, and goat anti-human AQP-2 (Santa Cruz Biotechnology), 1:200, antibodies. Data are presented as means ± SEM. All data were tested for significance using the one-way ANOVA test, and only results with P < 0.05 were considered statistically significant. This study was supported by a grant from the Swiss National Research Foundation to C.A.W. (31-068318) and the Hartmann-Müller Stiftung (Zurich, Switzerland). F.R. and A.V. contributed equally to this work and therefore share first authorship.